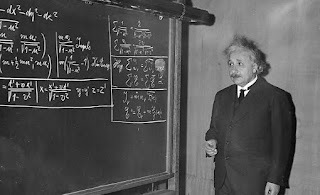 Energy Tribune has a BRILLIANT essay by William Tucker about Albert Einstein's classic equation E=mc2: the formula describing the interchangeability between mass and energy. Tucker's essay not only lays out E=mc2 in terms that anyone can easily grasp, it also argues why current efforts at renewable energy are not sufficient. Instead, Tucker lays out a solid case - using simple mathematics - for the use of nuclear energy and why it has a far less malign impact on the environment than we have come to accept. If you want an eye-opener of a read, check it out!